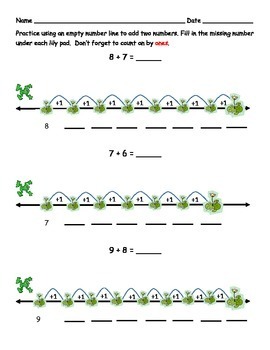 Use these fun frog themed pages as part of a scaffolded lesson on using the empty number line to add. The lessons are organized into sets of three. The first set focuses on adding numbers within ten, while the second set focuses on answers with teen numbers. Because each successive page decreases the level of student support, these pages can also be used as differentiated seat work or homework assignments. An additional page with ten practice problems follows each set. I've also included a Roll and Hop Addition Center Activity. 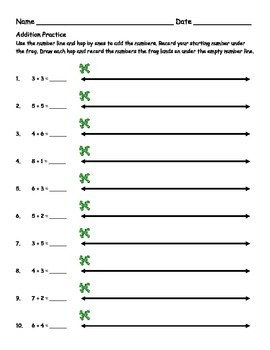 Students can use this game to practice addition using the empty number line strategy. 1.OA.5 Relate counting to addition and subtraction (e.g. by counting on 2 to add 2). 1.OA.6 Add and subtract within 20, demonstrating fluency for addition and subtraction within 10. 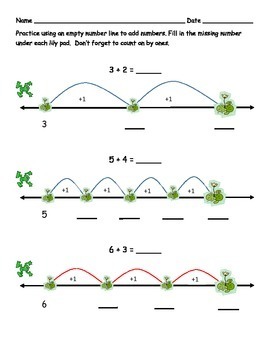 Use strategies such as counting on; making ten (e.g. 8+6=8+2+4=10+4=14); decomposing a number leading to a ten (e.g., 13-4=13-3-1=10-1=9); using the relationship between addition and subtraction (e.g. knowing that 8+4=12, one knows 12-8=4); and creating equivalent but easier or known sums (e.g., adding 6+7 by creating the known equivalent 6+6+1 =12+1=13). 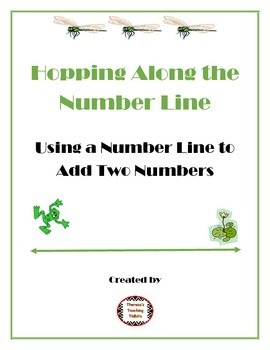 Hopping Along the Number Line First Grade by Theresa's Teaching Tidbits is licensed under a Creative Commons Attribution-NonCommercial-NoDerivs 3.0 Unported License.